I'm fascinated with making critters that are poseable, and my search is always on to find and refine my creations… And I am always getting distracted by other crafts, there is only one way for me to “work out” how things are constructed and that is to “play” take things apart or build things up. Not to be dishearted, I looked for something that wasnt quite a collectors piece and of course if I was buying a “doll” then I always had the excuse that it was for my granddaughter, always a good excuse…. I located an AI doll, it had all of the basic ball joint atributes of course it was in hard plastic a sort of cross between a BJD (ball joint doll) and a fashion doll. I was pleasantly surprised with the quality of this little doll and it had a resonable range of movement. So the butchery, er exploration began…. Sealed, and then pastels and paints at the ready, the work began…. I wouldnt say it was a labour of love, more the fact that I knew if I managed to rebuild it my granddaughter would love it, just because it was small and posable. Well after much cussing, messy spraying I did manage to get it back together, easy to get one elastic through the tiny holes but double??? I completed her with an alpaca wig (had to try) eyelashes and mini teddy bear. 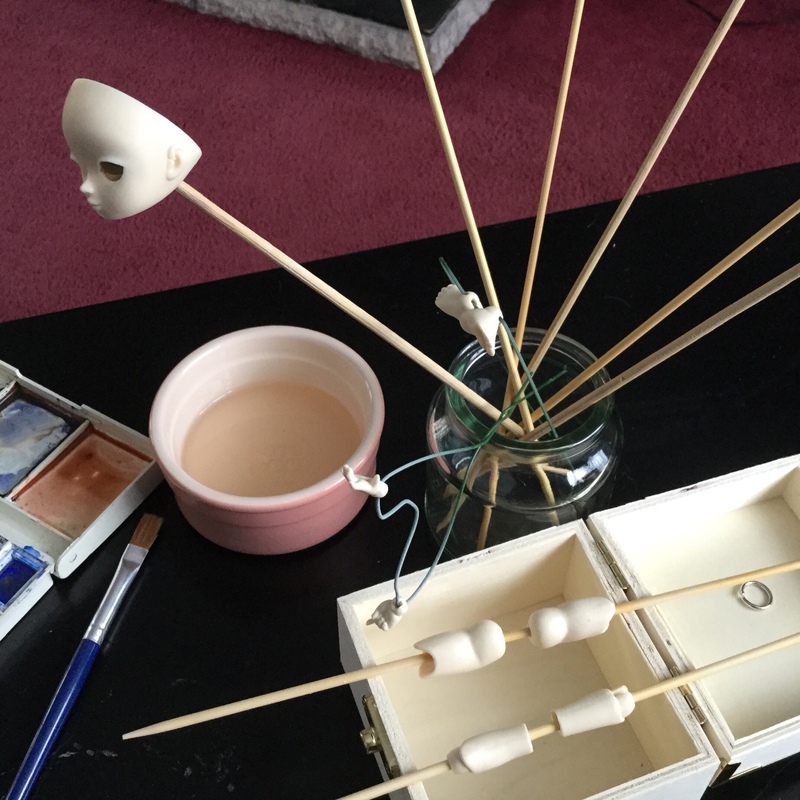 Then I discovered a micro 3D printed ball joint doll kit, oh my a technology produced kit, very reasonable cost… had to. It would satisfy my curiosity about tiny joints, and just what 3D printing material felt like… Im like a kid at christmas, all these toys. Well you have to suffer for your art sometimes dont you? David Currell gives a series of instructions on different joints, including ball joints, in his book Making and Manipulating Marionettes. Lots of diagrams and discussion. Getting back into the creative flow…..